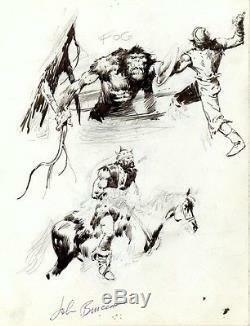 Pencil & inked sketches by JOHN BUSCEMA on one page. 3 figures on the front and 2 on the back of the page! I think they are from the late 1980s! A very nice inked swamp monster and various barbarians and huns! The bowman looks like Conan! X 10 inches art board! Beautiful partial inks by Big John himself! 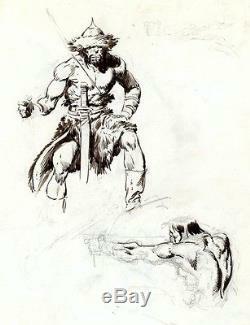 Great piece for any Buscema fan, very nice in person! The pencil lines look tighter in person than on the photo. What you see is what you get - see photo! Deutschland + Österreich: NUR Banküberweisung als Zahlung akzeptiert! I currently sell more original comic art! The item "John BUSCEMA 5x ORIGINAL ART CONAN MONSTER Swamp Thing Barbarian" is in sale since Thursday, October 13, 2016. This item is in the category "Collectibles\Comics\Original Comic Art\Interior Pages". The seller is "galactonaut" and is located in Wien.